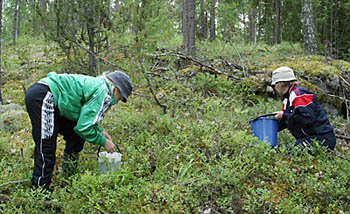 Collecting mushrooms and berries for private consumption is popular and common in Finland. The abundant crop can also provide significant earnings locally. Apart from wood, forests also yield other products such as berries,mushrooms, herbs, lichen, game, reindeer meat and skins,and Christmas trees. Picking berries and mushrooms and huntingare also classified as recreational uses of forests. Secondaryproducts of wood include tar, bark bread, sap, birch bark, coniferbranches and cones. Commercial health products derived fromforests include xylitol and various fats. The economic significanceof non-wood products is small compared to the income fromsale of wood products. Income from non-wood products can,however, be significant for private households. Game species in Finland include 34 species of mammals and 26 species of birds, most of which have their habitats in forests.Economically the most important game species is elk. The estimatedwinter population and elk bags peaked in 2002–2003 but have declined significantly since then. The annual bag ofmoose and other cervids in the 2000s was about 94,000. Otherimportant game species are forest game birds, hare and furanimals. However, populations of forest game birds and hencetheir bags have declined in recent years. The calculated meat yield of the entire combined game bag onaverage per year over the ten-year period 2000 to 2010 wasabout 11,6 million kg, of which 10,4 million kg was from cervids.The estimated value of the bag was about EUR 70 million per year. Table 3.3. Amount and value of various forest products, 2010. Some material forest products have been excluded from this table due to the lack of information, and some figures presented here are estimates.In this table, fuelwood includes roundwood and forest residues, and forest chips include only wood of Finnish origin. Information concerning wild berries and mushrooms are from companies trading them. A major part of outdoor market trade as well as picking for personal use are not included in the figures. The amount and value of this kind of use has been for berries 6–9 times, and for mushrooms 2–6 times that of commercial picking during the first decade of the 2000s. Because the majority of game hunted or trapped is kept by thehunters themselves and only a small percentage ends up beingsold commercially, the monetary value of the game bag can onlybe estimated. The number of registered hunters has tripled sincethe 1930s, and is currently about 300,000. The expenditure onhunting equipment and the value of time used for hunting aremuch greater than the value of the bag. About half of all Finns gather wild berries or mushrooms everyyear. Nevertheless, only a small part of the crop is collected,most of it for private consumption. There are 37 species of ediblewild berries in Finland. The most important ones are bilberry(Vaccinium myrtillus), cowberry (Vaccinium vitis- idaea) andcloudberry (Rubus chamaemorus). The overall annual berry cropis estimated at between 500 and 1,000 million kg. In a goodyear, the cowberry and bilberry harvest picked is about 50 millionkg and that of other berries 10 million kg. Increasingly, foreignlabour is hired to pick berries. Many tree species are a rich source of bioactive compounds. 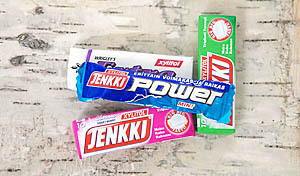 Caries-inhibiting xylitol is extracted from birch trees. There are about 200 species of edible mushroom in Finland, ofwhich 23 are accepted as marketable. In a good year, the cropof edible mushrooms available for picking can be in the vicinityof 360 million kg. The harvest of edible mushrooms is usuallybetween 5 and 9 million kg, but in the best years it can bemore than 13 million kg. There are 28 wild herbs in Finland which are collected commercially.They are used for food products, herbal remedies andcosmetics. Star reindeer lichen (Cladonia stellaris), which is collectedfor ornamental purposes, is an economically significantsource of income in the Oulu area. The reindeer herding area in northern Finland covers 36% ofthe total land area of the country. In 2010, there were about 4,600 reindeer herders, and their winter herds (i.e. animals notintended for slaughter) numbered about 203,700 reindeer inall. In the 2000s, some 107,000 reindeer were slaughtered annually,three fourths of them calves. The average annual meatyield was 2.5 million kg, with a market value of EUR 17,2 million.The main products of reindeer husbandry are meat and meatproducts. By-products are skins, horn and bone. Reindeer arealso used in tourism.